While predicting exact fall foliage timing in Canada may be tricky, you can get a leg up on your fall vacation by visiting prime viewing locations. Intensity and pervasiveness of autumn color tend to be best in the eastern parts of Canada; so, although the western provinces have something to offer, if the sole purpose of your visit is to see fall foliage, Ontario, Quebec, or the Maritime provinces are probably your best bet. Here are 10 of the best spots in Canada to take in the changing colors of autumn leaves, starting in the west and moving east. In September and October, the days are warmish and dry in Alberta's Rocky Mountains. The summer crowds have gone home, providing a peaceful atmosphere as you drink in the reds and yellows of the sub-alpine larch and aspen trees. Try accessible spots such as Johnston Canyon and Tunnel Mountain near Banff National Park or hike up to Lake Agnes from Lake Louise. 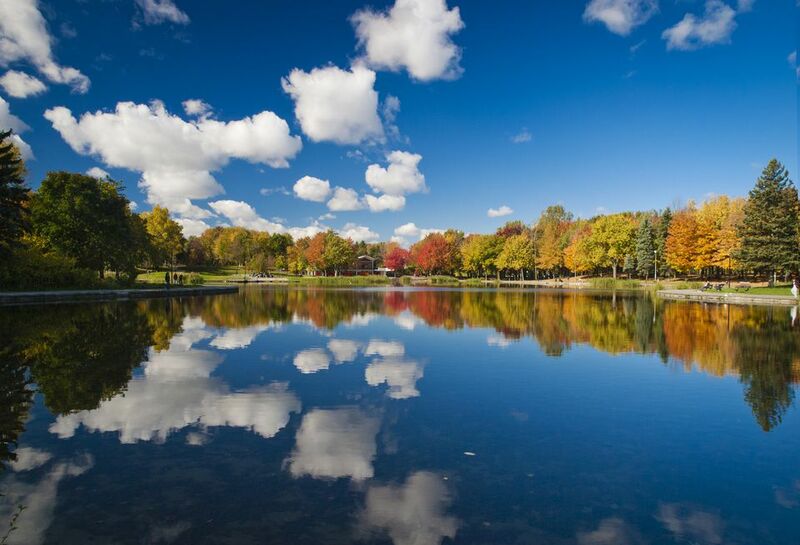 The size, beauty, and proximity to Toronto of this 4,800-square-foot park make it one of the most popular parks in Ontario. Algonquin Park is comprised of dense forests and thousands of lakes and rivers that can only be explored by foot or canoe. The maple trees are at their best at the end of September or early October, while aspens, tamaracks, and red oaks reach their peak in the middle or end of October. Consult the Algonquin Fall Colour Report ​for fall color activity and specific viewing spots. The Agawa Canyon tour train, which runs north from Sault Ste. Marie in northern Ontario is another excellent way to see the colors around the end of September and beginning of October. There is nothing more spectacular or romantic than the dramatic changes autumn brings to the forests of Eastern Canada. ​Via Rail offers a six-night fall foliage vacation that features some of Canada's most dramatic viewing spots through popular cities such as Toronto, Montreal, Quebec City, and Halifax. The historic Niagara Parkway, or "River Road,” is the route that Sir Winston Churchill called "the prettiest Sunday afternoon drive in the world." This parkway follows the winding curves of the Niagara River, which divides Canada and the United States. The loveliest stretch in autumn, between the small towns of Queenston and Niagara-on-the-Lake, reaches its pinnacle of color in early October. Finish your day by enjoying a glass of ​wine from one of the many wineries in the area. Check the ​Ontario Parks Fall Colour Report for autumn color activity and great viewing spot suggestions. Québec is famous for its autumn colors because of the sugar maple trees. Also prevalent are the provincial yellow birch and the American beech. Try the Laurentian Mountains for one of the most beautiful displays of fall foliage in North America. Colors begin their peak at the end of September and continue until mid- to late-October in lower elevations and more southern locations. Celebrate the season by visiting resort town Mont Tremblant for its annual Symphony of Colours festival. Prince Edward Island (PEI) forests have an exceptional range of colors in autumn. The warm waters of the Gulf of Saint Lawrence and the Northumberland Strait give PEI a relatively moderate climate and help create one of the longest fall foliage periods in northeastern North America. In addition, PEI's forests are bear-free and there are no deer or moose, ensuring a safe, hunter-free environment. Hailed as one of the world's most beautiful drives, the Cabot Trail winds around ​Cape Breton Island's northern shore and rewards fall color seekers in a spectacular way. Fiery reds, oranges, crimsons, and golds blanket the highlands and reach their peak the first or second week of October. Try visiting Cape Breton Highlands National Park or Kejimkujik National Park and National Historic Site. Like the Cabot Trail, the Fundy Coastal Drive is another outstanding maritime journey. See some of the highest tides in the world and enjoy the vivacious reds and deep pumpkin oranges, which are at their best the first two weeks of October during Canada’s Thanksgiving weekend. Tree variety and colors are similar to New England's, yet crowds are minimal in New Brunswick by comparison.